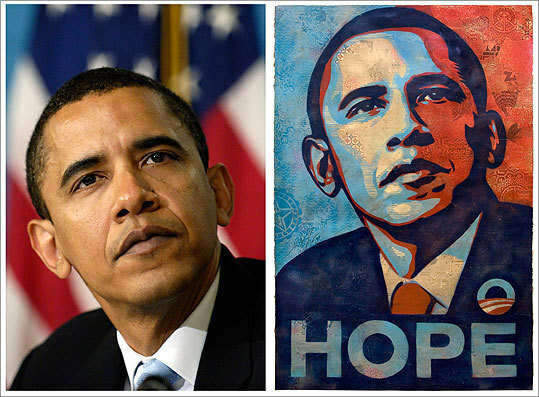 NEW YORK - On buttons, posters, and websites, the image was everywhere during last year's presidential campaign: a pensive Barack Obama looking upward, as if to the future, splashed in a Warholesque red, white, and blue and underlined with the caption HOPE. Designed by Shepard Fairey, a Los-Angeles based street artist, the image has led to sales of hundreds of thousands of posters and stickers and has become so much in demand that copies signed by Fairey have been purchased for thousands of dollars on eBay. The image, Fairey has acknowledged, is based on an Associated Press photograph, taken in April 2006 by Manny Garcia at the National Press Club in Washington. The AP says it owns the copyright and wants credit and compensation. Fairey disagrees. "The Associated Press has determined that the photograph used in the poster is an AP photo and that its use required permission," the AP's director of media relations, Paul Colford, said in a statement. "AP safeguards its assets and looks at these events on a case-by-case basis. We have reached out to Mr. Fairey's attorney and are in discussions. We hope for an amicable solution." "We believe fair use protects Shepard's right to do what he did here," says Fairey's attorney, Anthony Falzone, executive director of the Fair Use Project at Stanford University and a lecturer at the Stanford Law School. "It wouldn't be appropriate to comment beyond that at this time because we are in discussions about this with the AP." Fairey, in Boston for the opening of his solo show at the Institute of Contemporary Art, could not be reached for comment. The ICA declined to comment on the case, said deputy director Paul Bessire. Punk rocker and social activist Henry Rollins, a friend of Fairey's who contributed an essay to the ICA show catalog, dismissed AP's claim. "Shepard's image is his interpretation of an image," he said. "That is to say, it is not a photograph of a photograph, but a drawn image that resembles a photograph. Basically, AP's got no traction here. Nice try. Art wins again." Fair use is a legal concept that allows exceptions to copyright law, based on, among other factors, how much of the original is used, what the new work is used for, and how the original is affected by the new work. Fairey is not the first artist accused of copyright infringement. Campbell's raised the issue when Pop Art icon Andy Warhol created his famous works inspired by a soup can; no legal action was taken. More recently, visual artist Richard Prince, who typically takes photographs used in ads and blows them up to make gallery pieces, has been sued by a French photographer for using his images without permission. A longtime rebel with a history of breaking rules, Fairey has said he found the photograph using Google Images. He released the image on his website shortly after he created it, in early 2008, and made thousands of posters for the street. As it caught on, supporters began downloading the image and distributing it at campaign events, while blogs and other Internet sites picked it up. Fairey has said that he did not receive any of the money raised. A former Obama campaign official said they were well aware of the image based on the picture taken by Garcia, a temporary hire no longer with the AP, but never licensed it or used it officially. The Obama official asked not to be identified because no one was authorized anymore to speak on behalf of the campaign. The image's fame did not end with the election. It will be included at the ICA exhibit, opening tomorrow, and a mixed-media stenciled collage version has been added to the permanent collection of the National Portrait Gallery in Washington. "The continued use of the poster, regardless of whether it is for galleries or other distribution, is part of the discussion AP is having with Mr. Fairey's representative," Colford said. Associated Press writer Philip Elliott in Washington and Geoff Edgers of the Globe staff contributed to this report.